Not Enough Items Mod (NEI) is a success to both TooManyItems and Recipe Book. It arose around the same time as Craft Guide when Alexandria and a few others on the IRC suggested that I merge both TooManyItems and Recipe Book to remove their greatest flaws and ironically too many items, or in the case of Recipe Book, there are too many recipes. TooManyItems was great, but the one thing it lacked was an easy way to search and sort your items. When you had a mod like Red Power coming along with 10000 items, both TMI and Recipe Book were racking up the pages. Even if you don’t want to use NEI for cheating in items, you will likely feel right at home with the Recipe component of the mod. 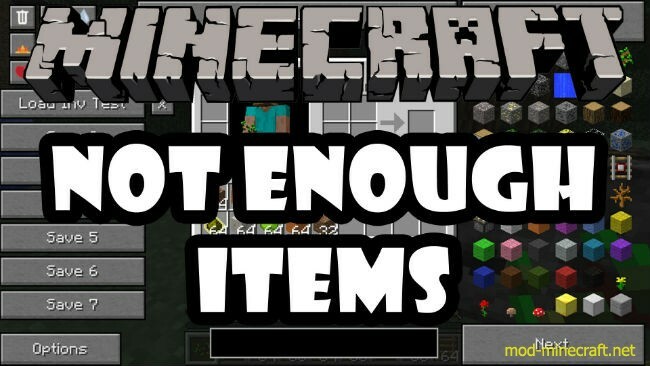 Not Enough Items Mod is one of the best games in Minecraft because it is the best combination of several interesting games. Let’s join with us to feel relax all your time! There is an extended API built in to NEI to allow mods to integrate properly. This is demonstrated with the RedPower module that provides Alloy Furnace recipes and RedPower specific subsets. I am aware that there are many different crafting inventories out there. BTW’s anvil, IC2 has a bunch etc. However I only use the Alloy Furnace from RedPower. Therefore I welcome modders who want to make small modules like the RedPower one for various other mods. The source package should help guide modders through. NEI uses a modloader like config loading system. Simply call your configuration class NEI****Config.class and implement IConfigureNEI and package it with your mods. Any calls to NEI should be made from this class or subclasses. Your mod must not directly call any NEI functions or classes as that will make it dependant on NEI to function. Simply include the config and classes with your mod and it will be activated only if NEI is installed.